*Free, but to participate in the Derby Decorating Contest, you'll need to purchase a hat for a nominal fee. Come to the 32nd Annual Easter Parade & Spring Festival on April 20th, Lakeshore Baptist Church and down the Avenue. 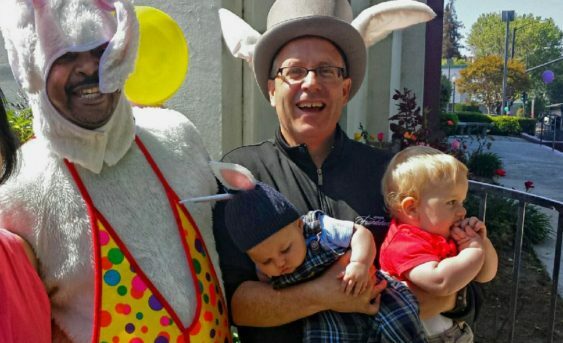 Meet the Easter Bunny for egg and hat decorating (to wear in the parade), face painting, corn dogs, all free to Oakland kids. The event starts at 10:30 am, parade down the Avenue at 11:30 am. Decorate your hat first or at the festival. The Easter Bunny will give out baskets full of goodies too. *Free Peet's handcrafted beverage to those that bring their own mug - one per person per day. *Free, but Facebook RSVP is requested. Be sure to bring a picnic lunch. *Admission and parking are free. *The entrance fee waiver for fee-free days does not cover amenity or user fees for activities such as camping, boat launches, transportation, or special tours. Although the entrance fee is waved, paid parking/shuttle reservations required for Muir Woods even on free days. *$9 Stanford student admission, otherwise we believe it's $25. Free admission for kids under 5. *The outdoor egg hunt is free and open to the public. Food and drink available for purchase. Tickets to tour the Winchester Mystery House available for purchase. *Three different sandwiches to choose from for $4.20 each - all week. Must purchase drink and chips. *Free to attend. We don't know if any of the activities require additional cost. *Free, but bring cash for beer & food purchase. *Free, but donations are welcome. *FREE sandwiches to the first 50 people in line at 4:20pm on Saturday, 4/20 at either of our locations, SF or Berkeley. There's one catch though--you have to follow us on Instagram to get your free sando. *Tickets are free, but seating is limited, so reserve your seats online. *Free, but an RSVP is required. A password is required to RSVP. *Early Bird tickets at $5.97 until 4/12. Otherwise, $10. *Free with RSVP. Donations are accepted.